A Blackboard Assignment is a drop box that accepts submissions from students based on parameters set when the assignment is created. 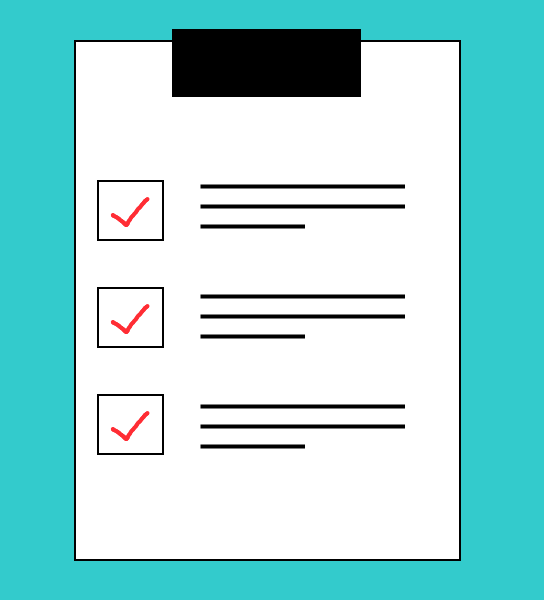 The Inline Grading annotation tool known as Crocodoc, is the online tool provided within Blackboard Assignment, for annotating assignments. Blackboard are retiring the inline grading Crocodoc element of the Blackboard assignment. It will be replaced with a new product called Box View. Simple – after 28th October do not use the inline grading tools – that is do not mark online with Blackboard Assignments. 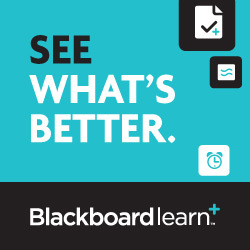 You can still create Blackboard assignments, accept submissions and download original submissions for offline marking and feedback. Originality reports and plagarism checking through Safe Assign will not be affected. What about work already marked? 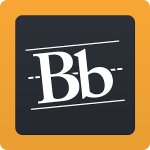 Blackboard will retain all existing annotations. These will be incorporated into a pdf along with the original document. Although further editing, updating or deleting of the annotations will not be possible. The annotated pdf will be available to view through the Grade Centre. Please note students will not be able to download these annotated .pdfs. When will the new Box View be available? 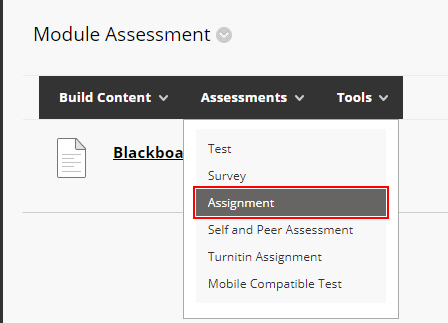 A number of system changes will need to take place in the background before the new Box View for Blackboard Assignments can be enabled. LTD will begin testing as soon as the update is available (this is expected to be in November). We will then be in a position to share more detail about the timeline for using new Box View as soon as possible following this work. Feel free to email LTDSupport@edgehill.ac.uk or phone us on Ext 7754 and we’d be more than happy to answer any questions or just get in touch if you would simply like to know more. With a few clicks your course list can be transformed, from a distracting jumble in to a clean, contemporary, George Clarke esq, Amazing Space! Remove the tick from “Expand Term” for each academic year and click “Submit”. 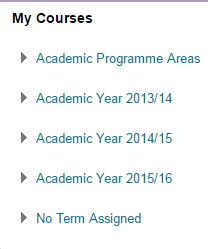 To view your courses simply click the arrow next to an academic year. 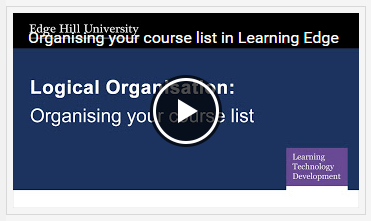 We hope you like the new course list organisation tool. Please contact the Learning Technology Development team to share any questions you have. Leave a comment below, email ltdsupport@edgehill.ac.uk or call 01695 650754. The scheduled summer upgrade has been completed successfully and you can now login to Learning Edge as normal. The upgrade introduces a number of improvements, which we hope you will like! 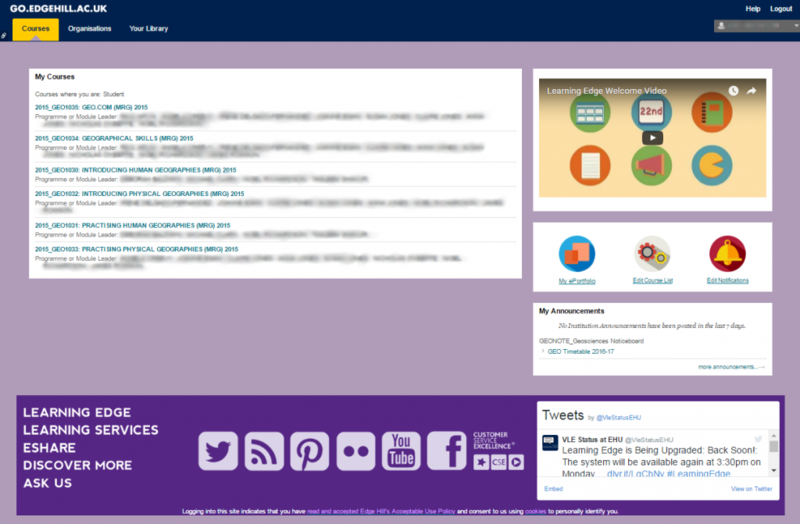 Your faculty resources page is now ‘My Library’. This page gives you easy access to your library account summary, library catalogue and discovery search tools, subject librarian contact details, study toolkits and lots more … check it out! As mentioned in the previous summer upgrade blog post, the LTD team have introduced a number of other new features. As well as the Blackboard Learn – Interface Changes and General Updates, the Qwickly Attendance (Online Register) tool has been updated as has Blackboard Collaborate (Virtual Classrooms). You can contact us to discuss any aspect of the upgrade, including new features, so we can help you make the most of the new improved system. 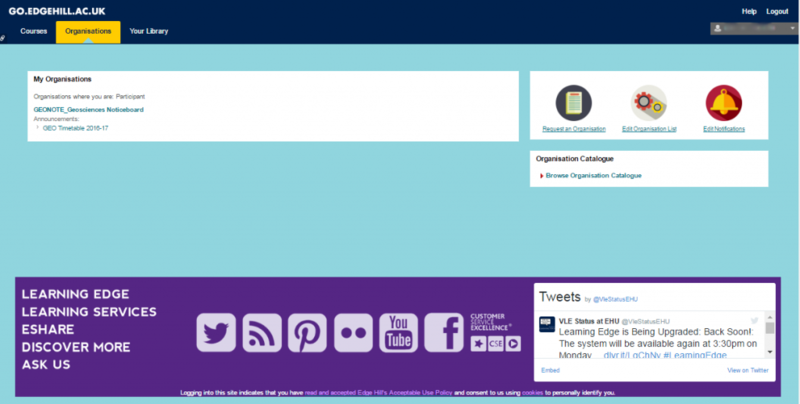 Take your time to explore the upgraded system and let us know what you think. The LTD team have worked hard to test the upgrade so we do not expect any issues! However, if you do spot any anomalies please let us know ASAP so we can investigate and get them resolved for you. 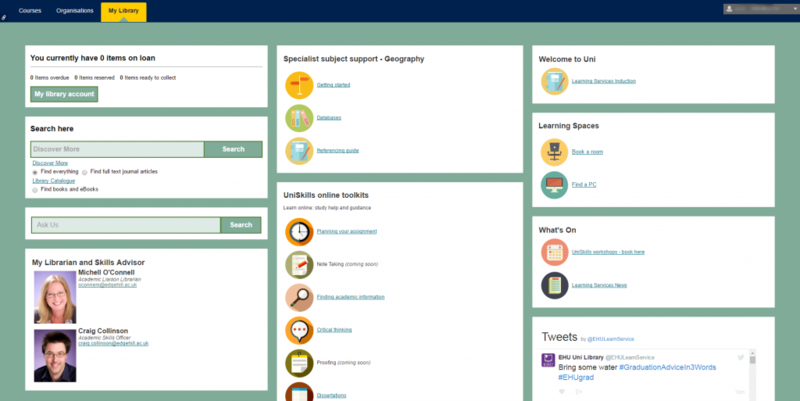 Contact the Learning Technology Development team to share any queries or comments you have regarding the upgrade or the online webinar– leave a comment below, email ltdsupport@edgehill.ac.uk or call 01695 650754. Our colleague David Callaghan is currently looking in to the new aspects of this revamped product. 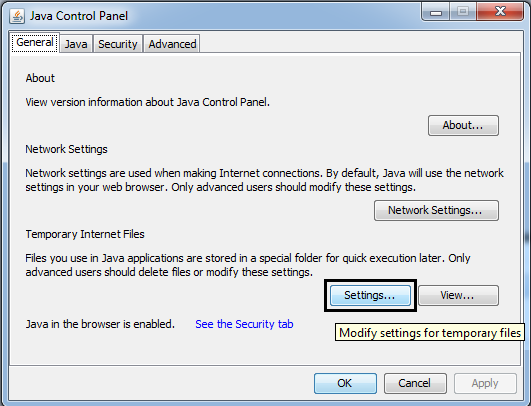 The main change is the move away from having to install any Java applets before launching a session. There is also a ‘swishier’ minimalist interface, with easy access tools. The whole product has been rebuilt and quite frankly looks great, although some features are currently missing such as break-out rooms and polls. These are promised soon! The Collaborate ULTRA Building Block (B2B) was released last Friday (17th) which is great news as this was holding up our testing. We look forward to incorporating it soon. The new student version of Mobile Learn (UK) has been promised by Q3 (although we suspect we may not actually see it until the end of the year). The very final session we’ll be attending is the International Product update, so more to come on our final post. The new Instructor app is ‘coming soon’. 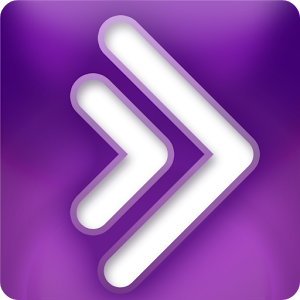 This will be a dedicated app to support academic staff in using Blackboard on their mobile device. There is currently available a Bb Grader app for iOS but this is purely to mark papers. 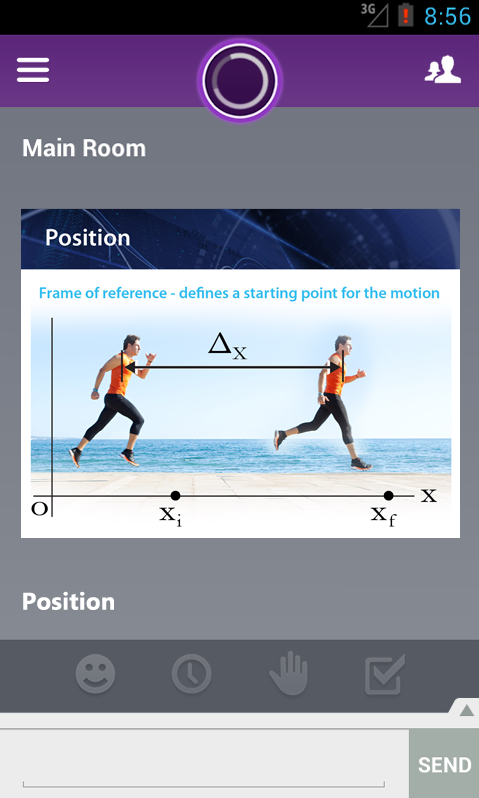 The new Instructor app will incorporate most tools but specifically for Instructor use with Instructor functions. There will also be an Android version. While looking round the exhibition hall, we took some time to speak to vendors of proctor (or invidulator) free testing environments. One that stood out was Respondus Lockdown Browser and Respondus Monitor and it’s something we will be feeding back to our colleague Martin Baxter who is working with the Business department to evaluate online testing environments. Well that was the feedback from colleagues in the audience, following our presentation. Carol and myself presented on the customisations Edge Hill University had implemented to Blackboard Community Engagement over the past 24 months. The presentation was well received and many institutions both applauded the customisations we had delivered and empathised with the challenges we faced; from Tab and Module administration/management to the particulars of sourcing reliable accurate data for staff secondary institutional roles. One particular section of the presentation that stood out was our implementation of the NEW_STARTER role for new students joining the institution. Colleagues were fascinated to find out how the data was sourced to facilitate this role. We also suggested alternatives, such as an adaptive release for those who didn’t have technical support readily available, to implement a data feed. During our Q&A session, a discussion took place surrounding the future of Tabs and Modules and how they will fit in following the announcement of ULTRA. Fortunately, Matt Franks From Blackboard was able to provide some guidance on the UX in the next version of Blackboard. After the discusion he asked for our feedback on a beta design of Tabs and Modules. As we have extensively customised our environment. Matt asked if we would like to be part of the client consultation process so we exchanged contact details and will now be feeding directly in to the research and development of the new Blackboard user interface, in particular Tabs and Modules! Our final post from the conference will be coming soon! Have you ever come across a broken link to an external website? Annoying isn’t it? Especially if the content you want to access has moved to a different location, requiring you to start searching all over again. Fortunately in Blackboard this is now a thing of the past! 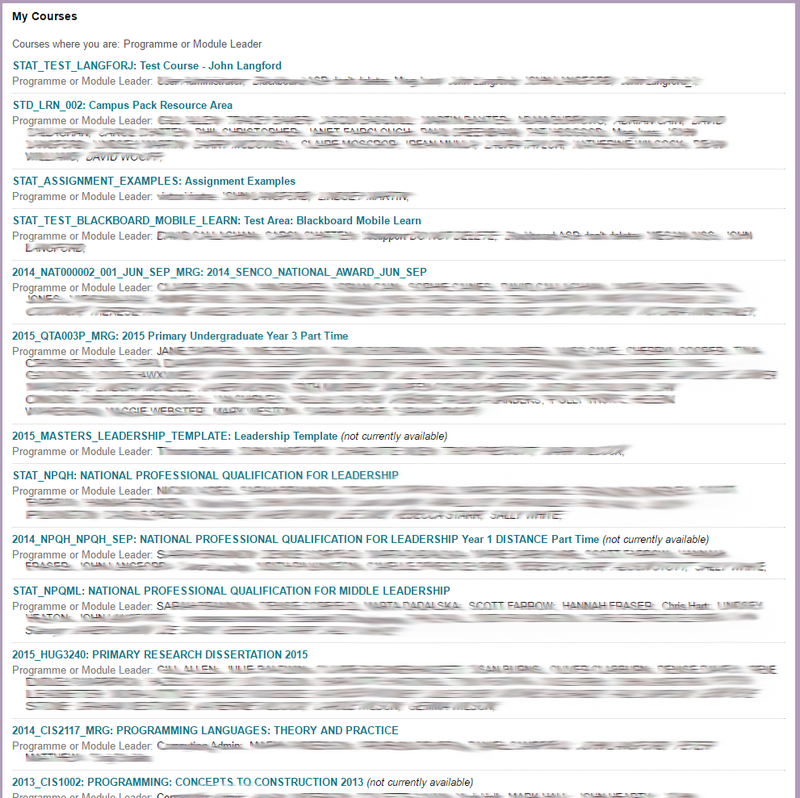 As a tutor you can check the validity of your external web links in your Blackboard course area. 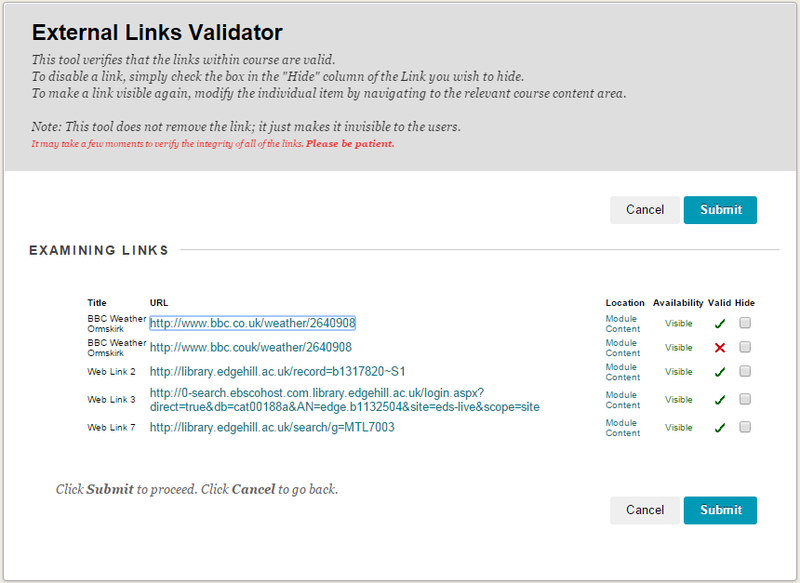 The External Links Validator lists all your course content links to external sites and displays whether they are valid or not. 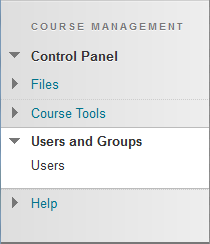 The Link Checker can be launched from the Course Tools section under the Control Panel, on the left hand side of the course page. Once the Link Checker is selected the tool will load all the external links contained in the course area. You can then easily see which links are valid or not. There’s also the option to hide invalid links, to instantly remove them from your course and improve the student experience. Learning technology Development (LTD) are always looking at ways to add functionality and improve the Virtual Learning Environment (VLE) Blackboard 9.1. Following the our recent transition from the Section Merge Tool (SMT) to the Course Relationship Tool (CRT), I thought it would be a good idea to follow up with a blog post on some useful user management techniques in Learning Edge course areas. The topics discussed will focus on the Users and Groups section in the course Control Panel and will be particularly useful for Course Administrators. 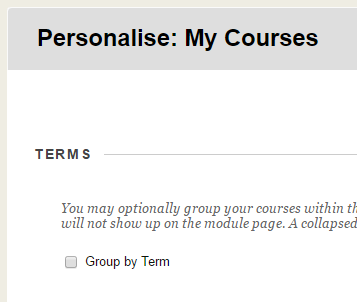 This replaces the function to ‘Remove Users from Course’ which used to delete the user’s enrolment. 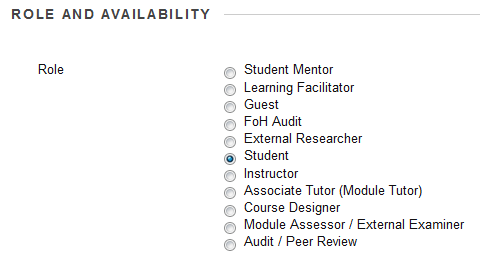 You can now ‘Change the User’s Availability’ which allows you to toggle if the user can view this course or not. Effectively setting the availability of the users enrolment to available (Yes) or unavailable (No). This also provides the added benefit of being able to switch back instantly, should you need to. Similarly, a users role can be modified in the same way. As always, if you have any questions please contact LTD Support on 01695 650754 or email ltdsupport@edgehill.ac.uk. 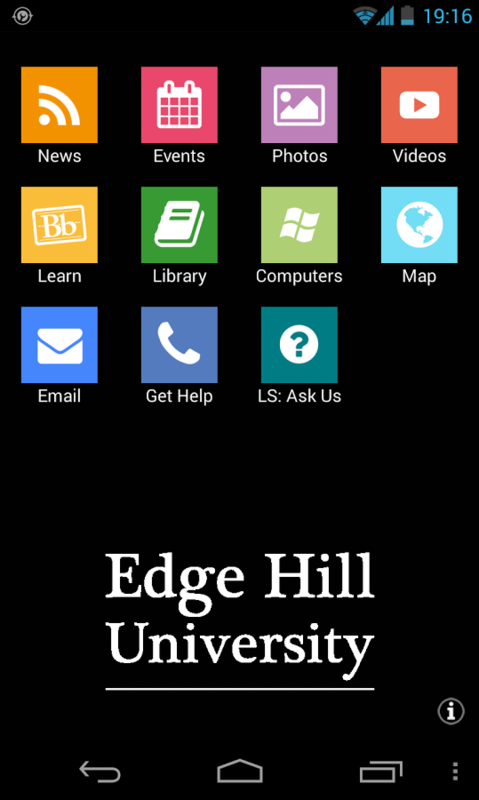 Smartphones and Tablets get better every year and more of you are using your mobile devices to engage with Edge Hill content on the go. Stay connected with Edge Hill University wherever you are. 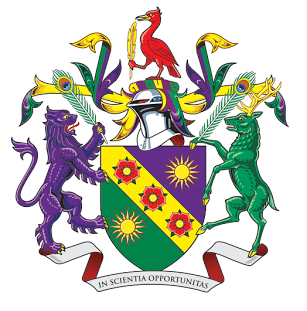 Look-up course information, search the library catalogue, check your emails and stay up-to-date with the latest university news, videos, images, and more. 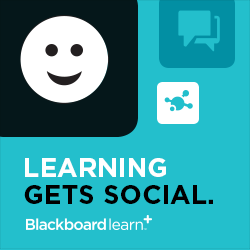 Blackboard Mobile Learn makes it easier for you to keep up with your courses by letting you access them whenever and wherever you want – now on WiFi and cellular! We have also bundled a copy of this in to the Edge Hill Central App – so there is no need to install separately. Blackboard Collaborate is Edge Hill’s web conferencing tool. Collaborate provides an online environment where students and staff can engage in a live web conference for online classes, meetings, one-on-one tutoring, and much more. In order to attend a Blackboard Collaborate session your tutor will need to schedule a session or create a room. As always, any questions on whats happening please contact LTD Support on 01695 650754 or email ltdsupport@edgehill.ac.uk. The summer is on the horizon, bringing with it not only better weather but a better Learning Edge too! 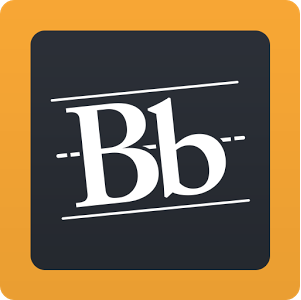 We are currently working with Blackboard to introduce a number of new features which will improve your experience and use of Learning Edge. This new tool will enable you to quickly view and verify the design of your course content and course navigation from the perspective of a student. This means that you will no longer need to manage the creation and enrollment of test student accounts. With the Blackboard assignment tool you will be able to grade anonymously and delegate grading responsibilities to other members of staff. With upgraded social learning tools including calendars, social spaces and improved cloud profiles, both students and staff can stay connected inside the traditional Virtual Learning Environment. 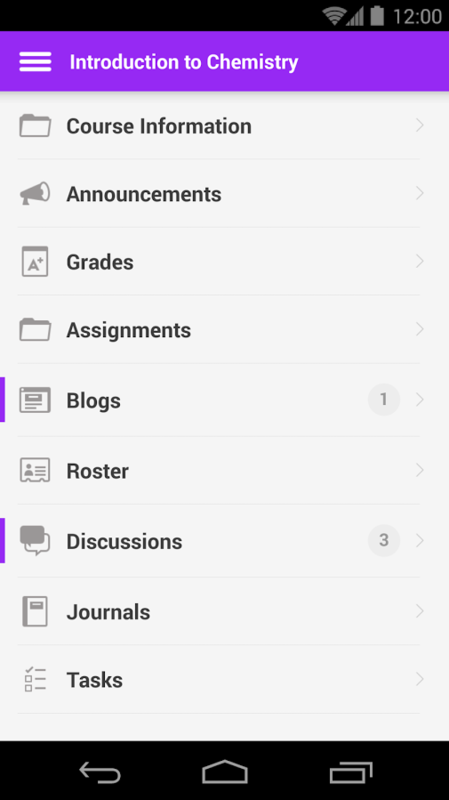 ‘My Blackboard’ also provides a convenient one stop location for frequently used tools, such as My Grades for students and the Retention Center for staff. In order for us to prepare for the upgrade, we will be carrying out extensive testing throughout May, June and July. The important dates for you to make a note of are the 27th May and 23rd June, as LTD team will be unavailable for general queries. You can still email us on ltdsupport@edgehill.ac.uk with anything urgent, but LS help desk will be able to assist you on 01695 584286 with your general enquiries. Following successful testing the current target date for the upgrade is July 20th / 21st. Every now and again its a good idea to clear your cache. This applies to browsers (e.g. Internet Explorer, Firefox, Chrome), operating system temporary files and even the JAVA cache. 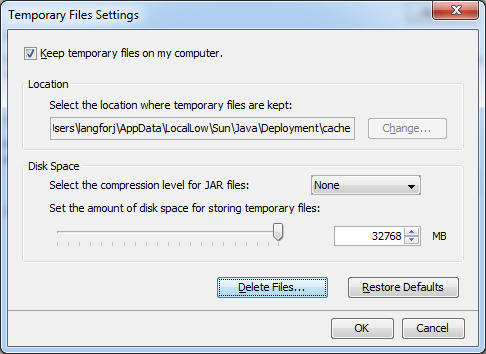 Following the recent JAVA 7 update 51 release (14th January 2014) some users who downloaded and installed the update may now need to clear their JAVA cache in order to use some of the Blackboard Tools (Multiple File Upload, Virtual Classroom and Chat). 1. Click on the start button and search for ‘Configure Java’. 4. In the Temporary Files Settings panel Choose the Delete Files button. 5. 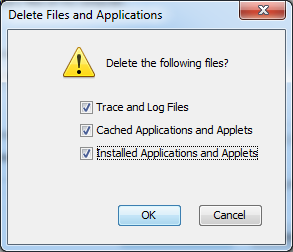 In the Delete Files and Applications panel make sure all options are selected and click OK. The process can take a few minuets, but once complete the panel will close and you can click OK on the remaining dialog boxes. 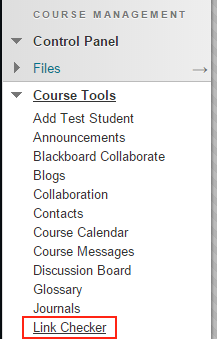 For further specific information about Blackboard 9.1 with JAVA 7 update 51, please see here. Where’s the subscribe button gone? You may or may not have noticed that the Subscribe button has recently taken a break from its duties. Well you’ll be happy to know you can fix this! In Control Panel open customisation and click on Tool Availability. Within the Tool Availability list scroll down and find Email.Put a tick in the Available check box (first check box). 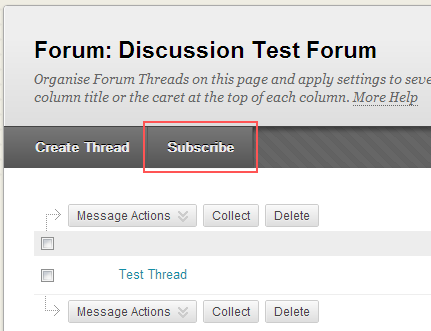 Now as long as you have set the subscribe property in the Forum settings, users will once again be able to subscribe to your forum.